PT Saka Energi Indonesia - SEI or most commonly known as SAKA Energi or PGN SAKA is an Indonesian oil and gas company with rapid business expansion. SAKA Energi engaged in upstream oil and gas activities. Its business include exploration, exploitation, business expansion in oil and natural gas, geothermal and shale gas. PT Saka Energi Indonesia is a directly-owned subsidiary company of state-owned natural gas transportation and distribution company PT Perusahaan Gas Negara (Persero) Tbk (PGN Group). As of December 2015, 99.997% of its shares are held by PT Perusahaan Gas Negara (Persero) Tbk, and 0.003% remaining shares by PT PGAS Solution. Based in Jakarta, SAKA Energi now has participating interest in several oil and gas blocks, both in Indonesia and overseas. 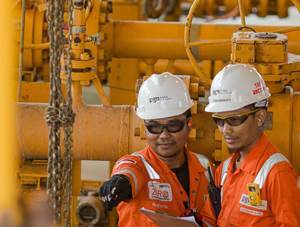 According to PGN Group Annual Report 2015 as cited by JobsCDC.com, SAKA Energi now has 8 oil and gas block in Indonesia and 1 block in overseas, comprise of Ketapang PSC (20%), South Sesulu PSC (100%), Bangkanai PSC (30%), West Bangkanai PSC (30%), Pangkah PSC (100%), Muriah PSC (20%), South East Sumatra PSC (8.91%), Muara Bakau PSC (11.6%) and Fasken USA (36%). IT Graduate : S1/S2 Software Engineering. Commercial Graduate : S1 any Engineering background. Drilling Graduate : S1 Petroleum Engineering. Exploration Graduate : S1 Geology. Finance Graduate : S1 Accounting. Audit Graduate : S1 Finance/Audit. HSE Graduate : S1 Environmental Engineering. Offshore Graduate : S1 Chemical/Industrial Engineering. Engineering Graduate : S1 Mechanical Engineering. Onshore Graduate : S1 Chemical/Industrial Engineering. Minimum GPA score 3.00 out of 4.00. Graduation day latest by July 2016 or less than 1 year of working experience. Functional related skills and knowledge. Involved actively in extracurricular activities. Human skills : learning courage, adaptation, initiative, communication, teamwork and interpersonal skills. JobsCDC.com now available on android device. Download now on Google Play here. Please be aware of recruitment fraud. The entire stage of this selection process is free of charge. PT Saka Energi Indonesia - SAKA Graduate Program PGN Group March 2017 will never ask for fees or upfront payments for any purposes during the recruitment process such as transportation and accommodation.